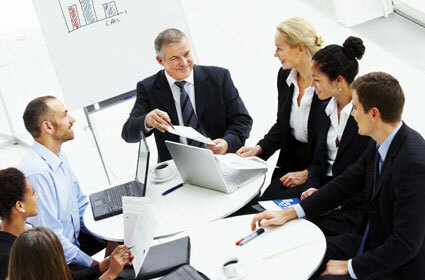 Welcome to CPA at Law, helping individuals and small businesses plan for the future and keep what they have. This is the personal blog of Sterling Olander, a Certified Public Accountant and Utah-licensed attorney. For over seven years, I have assisted clients with estate planning and administration, tax mitigation, tax controversies, small business planning, asset protection, and nonprofit law. I write about any legal, tax, or technological information that I find interesting or useful in serving my clients. All ideas expressed herein are my own and don't constitute legal or tax advice. Section 1.01 Detailed Introduction. This section number corresponds with the Article number (i.e., Section 1.01 is the first section of Article I, Section 2.3 appears in Article II, etc). Additionally, this section begins with a summary phrase describing what the section is about, and that phrase is formatted differently than the rest of the paragraph (in this case, it is underlined). (a) If Article I becomes Article II due to another article being added in front, it is critical that all of the sections numbers automatically update, for example, sections 1.01 through 1.06 become 2.01 through 2.06, and so on throughout the document. (b) It is also important that the "Detailed Instructions" introductory phrase be a "Heading" in Microsoft Word, but that the language that follows be excluded. The reason for this is so that a detailed Table of Contents can be automatically generated. (c) If a section is referenced within a sentence of the document, such as "see Section 1.01," it is critical that this reference update automatically when Section 1.01 changes to Section 2.01, and so on. 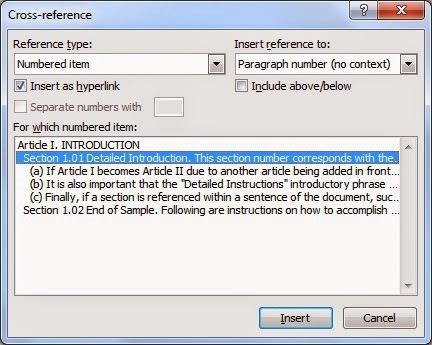 The first key to consistent formatting is to avoid all direct formatting in Word documents and instead use styles. There are dozens of websites that discuss how to do this (here is a link to one example), and so this won't be dealt with in detail here. However, as a starting point, it is helpful when Word identifies text that is formatted directly; to enable this, go to Word Options, Advanced, and make sure "Keep track of formatting" and "Mark formatting inconsistencies" are both selected. This causes "Article I." to be automatically added before the word "Introduction" in the document you just created. By right-clicking on "Article I," selecting "Numbering," and "Change List Level," you can change the outline level of the text. See if you can reproduce the sample document above by copying and pasting the text and formatting as Headings/Styles and adjusting the list levels of each Article/Section/Paragraph. All formatting should be done by right-clicking on the applicable style in the "Style" section of the Home tab, selecting Modify, and formatting in this way; alternatively, you can temporarily apply direct formatting to the text, right-click the applicable style, and select "Update Heading to match selection." The next task is to cause the text that follows "Section 1.01. Detailed Introduction" above to be formatted as a non-heading. To do this, hit "Enter" after "Detailed Introduction" so that the text that follows is in a separate paragraph, then click anywhere in the "Detailed Introduction" paragraph and press Alt+Ctrl+Enter to insert a style separator and bring the subsequent text up. For more details, see this link. Next, we want to provide for automatic updates to references to a Section. 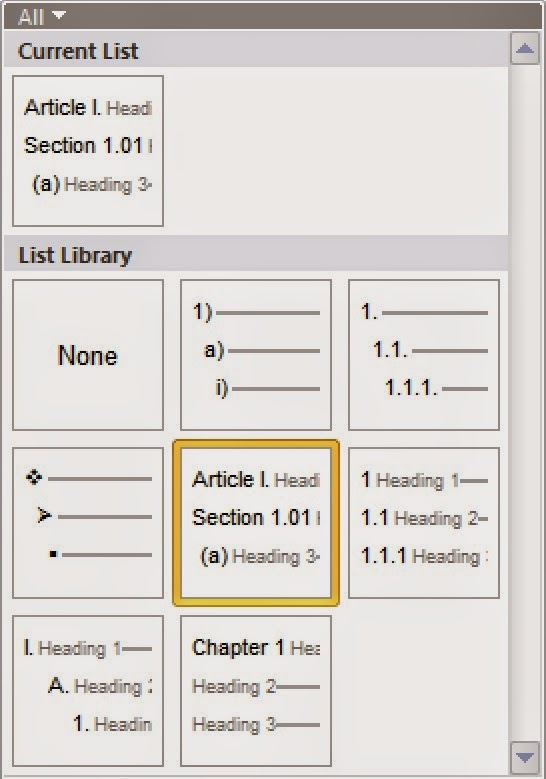 To accomplish this, don't type the reference to Section 1.01 directly; instead, select the Insert tab and click Cross Reference. In the box that pops up, select "Numbered item" for "Reference type", select "Paragraph number (no context)" for "Insert reference to", and pick the applicable numbered item from the list in the box below, as illustrated here. Finally, all that is left to do is generate a Table of Contents from the References tab. After editing the contract terms and immediately prior to printing, update the Table of Contents and section references throughout the document by selecting all and pressing F9. Certain individuals and groups insist that portions of the Internal Revenue Code do not apply to them. The reasoning in support of this position is generally based upon words and phrases in statutes and cases taken out of context. Many of these arguments have been deemed "frivolous" by the IRS, the making of which subjects the "tax protester" to additional penalties. Because the U.S. tax system depends, in large part, on voluntary compliance, tax protesters can point to various circumstances as "proof" that the techniques "work," at least temporarily. The IRS may accept tax returns with obviously understated income or overstated expenses and may pay out refunds as well. This "works," as Peter J. Reilly, writing for Forbes, pointed out, "if you are just about maximizing your current lifestyle rather than accumulating net worth and entirely amoral when it comes to meeting tax obligations." The case, Waltner v. Commissioner, TC Memo 2014-35, is a good read for anyone who thinks they may have found a book or website promoting a loophole in the Internal Revenue Code. Judge Buch had a clear intent to "inform the public of the court’s analysis" of frivolous positions of tax protesters. Hopefully, some will listen. The Bypass Trust: To "B" or Not to "B"? For many years, estate planners recommended planning that involved an "A/B trust" structure whereby assets of the first spouse to die equaling the estate tax exemption in value would end up in a trust to preserve that spouse's estate tax exemption. This prevented the surviving spouse from being "left with the couple's assets, but only their own individual exemption." Depending on a number of factors, this strategy could potentially save millions of dollars in estate taxes. The costs of this trust, which is known by many names including a "B Trust," "Credit Shelter Trust," "Family Trust," or "Bypass Trust," are not insignificant. The surviving spouse's access to the assets of the B Trust are necessarily restricted, tax returns must be filed each year the trust is in existence and has income, legal responsibilities are imposed on the surviving spouse or a non-spouse trustee for trust management, and there is no step-up in basis for the B Trust assets at the surviving spouse's death. Until recently, these costs could easily be justified by the potential estate tax savings. After the American Taxpayer Relief Act, however, the law allows the deceased spouse's unused exclusion amount to be transferred to the surviving spouse without the need for a B Trust. The unused exclusion must be calculated, and an election to transfer the unused exclusion made, on a timely filed estate tax return of the first spouse to pass away. Rev. Proc. 2014-18, effective January 27, 2014, allows for an extension of time to make this "portability" election for decedents who passed away in 2011, 2012, or 2013 and who were survived by a spouse. Such elections, made in conjunction with the filing of an estate tax return, must be filed by December 31, 2014. There are still benefits of a B Trust, namely, asset protection for the assets held by the trust, asset appreciation value that is excluded from estate tax, and greater certainty that the bequests contemplated by the first spouse to die will be carried out. However, the estate tax benefits to the B Trust have been reduced. While it a good idea for everyone to review their estate plan every few years anyway, it is particularly appropriate for those with A/B trust provisions included in a revocable trust package to review whether that is still appropriate. For surviving spouses stuck managing a B trust that is no longer justified, it is appropriate to have the trust reviewed to see if it can be modified to better achieve that spouse's objectives.